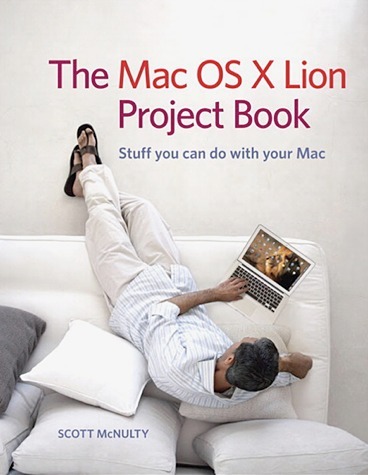 The Mac OS X Lion Project Book takes a look at stuff you can do on your Mac. It explores the new operating system along with additional popular software and hardware to further enhance your user experience. The most common projects you would be likely to undertake are explored within this book. Projects ranging from managing the files on your Mac to creating a Podcast are explored in detail. Each project is presented with the idea of achieving a specific task. It is assumed that you will have a basic knowledge of computing but the author does his best to simplify the process for new users to the Mac platform. At the beginning of each chapter you are instructed on the difficulty level, additional software which may be needed, and if any additional hardware is required. In many cases the applications discussed are either freeware or shareware thereby limiting any extra expenses for the consumer. All applications mentioned are at the epitome of their category. The final chapter is delivered around mainly hardware. At no time does the author limit a project to a specific piece of hardware. This allows users to be selective in what hardware they choose to use. One example of this is when reading through the chapter on Podcasting. The author recommends a good quality USB microphone, but also acknowledges that a USB headset which is often more affordable will also work. He also acknowledges that the built-in microphones are useable but sound quality will be diminished. I appreciate this form of writing as it gives everyone an opportunity to experiment and learn without the pressures to purchase additional and costly hardware. The same can be said for the suggested software options. The book is outlined across six main chapters with individual projects contained within. Chapter 1 explores managing your files. Specifically the usage of Smart Folders, Spotlight Searching, and installing applications from both the Mac App Store and individual developers websites. In this chapter readers also look at printing options and how to print without paper to PDF documents. Chapter 2 shows you how to interact with your Mac when you are in a remote location and away from your computer. Back to My Mac is used to showcase one way this can be achieved. The author also leads you through the best options when looking to undertake tech support for family and friends. Chapter 3 takes a look at your multi-media content and how to manage it for better consumption. Detailed instructions using the application HandBrake are issued to inform the reader how to take a DVD they own and place the digital content into iTunes, iOS devices, and an AppleTV. Television show DVDs are looked at in detail as they are slightly more complicated than a single movie DVD. Whilst there are legal implications of this process the author has offered a warning regarding the possible copyright violations. Chapter 4 deals with how to transform your media such as photographs. You are shown how to make intriguing vacation slideshows and family websites. This chapter introduces you to iPhoto, Flare, and RapidWeaver. Chapter 5 covers productivity for Mac OS X Lion. Many would agree we are limited by time in modern society. This chapter helps users limit distractions whilst undertaking work. RSS news feeds and NetNewsWire are also explored, for easy collation of online content. TextExpander is presented showing how you can save hours when typing repetitive tasks. Chapter 6 covers projects which require hardware in order to be completed. Readers learn how to produce an audio podcast, undertake a backup via Time Machine and SuperDuper!, and restore from these backups. GarageBand and adding your signature to a Preview document are also explored. If you are after a project focused book to work through then this title certainly fits the bill. Readers are be presented with not only concise information but lovely screenshots to showcase the step by step procedures. I would recommend this title to any new user to the Macintosh operating system. I would also advise it is suitable for intermediate users as some topic areas such as remote access are beyond the skill set and requirements of the entry level user. The only disappointment I had was in the length of the book. It would have been nice to have had more projects presented, such as perhaps in the areas of iWork applications and projects for Mail, Address Book and Contacts. Therefore I am awarding this book a MyMac review rating of 9 out of 10.